Infrastructure projects such as toll roads, bridges, subway systems, ferries and tunnels can generate revenues from traffic in a user-pay system, fixed availability payments or some combination. These projects can be public-private partnerships with various sorts of funding, guarantees and other items from the government. As traffic has a ramp-up period and generally grows with the economy thereafter and toll rates can increase with inflation, the cash flow pattern can have a pattern with high growth rates. 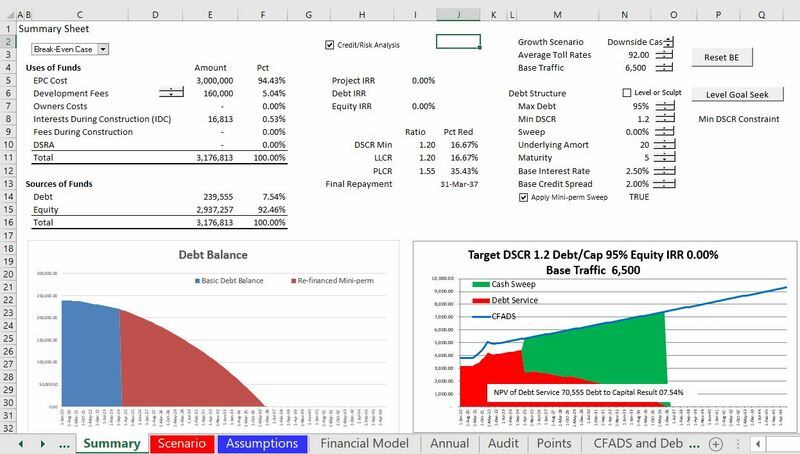 Various different forms of sculpting, demand notes and other features can be used to resolve low cash flows in early years. 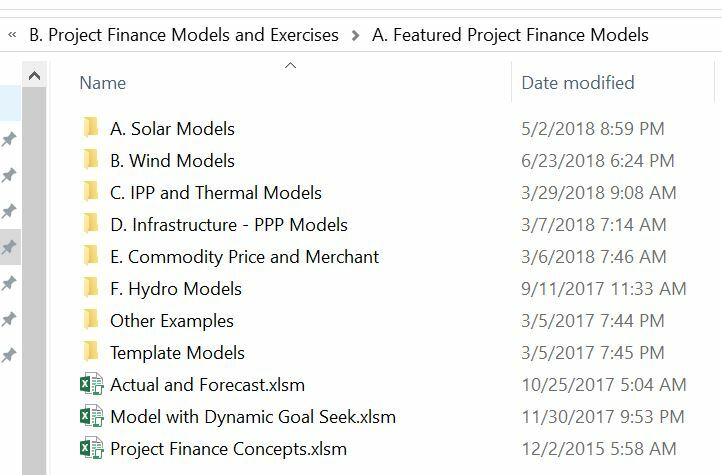 The files below demonstrate and the associated video present alternative ways to represent models of project finance of toll roads. The first model is from a HBS case study of the A2 toll road in Poland that was originally structured to take traffic risk. (Later it was converted to shadow tolls and I believe the traffic estimates were optimistic). The second file is for a PPP model and demonstrates issues with a toll road in Ghana that includes how the traffic studies are developed. The file that you can download by pressing the blue button below demonstrates some toll road issues in the context of debt structuring. It has some of the scenario analysis and other features that I apply in a lot of models. 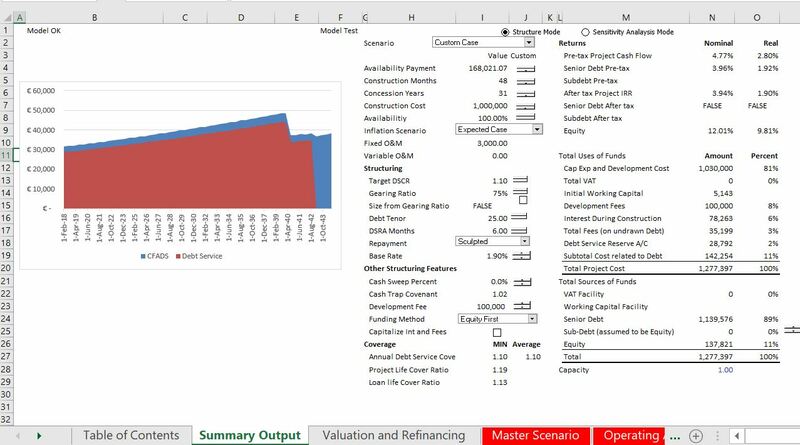 The screenshot below shows the summary page from the model. This model has some copy and paste macros instead of the much better UDF approach. I have also clipped a page from the working section. I did this model a while ago and instead of putting all of the switches in one place, they should be put where they are used. If you beg me I will send you some actual tollroad models as well. This is from a similar model that has the circular references resolved with UDF functions. You may think that a min-perm is a haircut. And a hard mini-perm has a lot of hairspray or something. You are probably correct. But an investment banker came up with the term and it applies to cases with built-in re-financing. The mini-perm structure can be used for toll roads where downside cases evaluate repayment of the mini-perm in lower traffic scenarios. You can press the button below to see an example of a mini-perm from a course that I had. below the button I have included a couple of screenshots from the model. The PPP model for added lanes of the current toll road between Kmasi and Acura includes analysis of willingness to pay, different traffic scenarios, government payments to make up deficits and other factors. 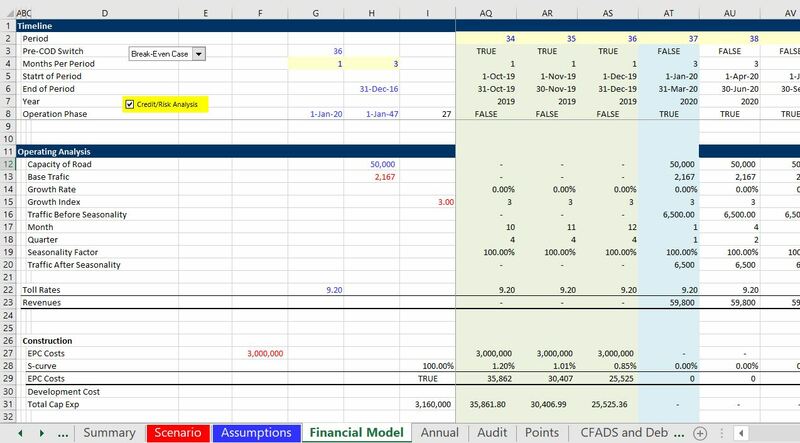 This shows the standard set-up of a scenario analysis using the INDEX function and a data table. I am sick of this and I think it may be better to use the scenario reporter. In this case there were manual counts of traffic and survey questions about willingness to pay (probably complete B.S.). Here is a layout of the traffic study which uses SUMIF to get the dates correct. The file below is for a U.S. road that went bust. I have modified some of the data in this file but it should give you an idea of what a toll road financing with traffic risk looks like. The model below is for the A2 toll road case that was the subject of a Harvard Case Study. The actual toll road did not work as planned and a system of shadow tolls were used. Truck traffic was below expected levels etc. Here is a screenshot of one of the pages of the model. I don’t know how much it will really help you in discussing the case. But you should understand the LLCR and the PLCR.